Nile Chilli Pepper An Aby from Aus! Nile Chilli Pepper, or Chilli, is a Tawny Abyssinian cat bred by George and Julie Kennedy of Nile Abyssinians in Sydney Australia. On the 23rd of January 2009, Chilli flew from Sydney to me in Tasmania. As some people may know, Tasmania is a small island located at the bottom of the main land of Australia, and there aren't many Abys here, the last breeder having retired in 2007. Chilli's not a breeding cat, and he's never been to a show, but he's still a very amazing little boy. Like most pedigree cats these days, Chilli is indoors only, clearly for his safety. I do agree that cats should be indoors only, but can you imagine living cooped up inside for your whole life, while the rest of the outside world passes by? It wouldn't be too great, which is why I chose to train Chilli to the leash! He's got a lovely Purple harness with a matching leash, on warm days I take him out and he has a ball! Chasing butterflies, stalking birds, eating grass, smelling the smells and seeing the sights! He loves it! He would walk in the sun all day if he could! 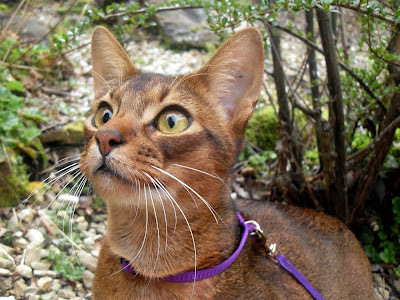 So there's just a bit on Nile Chilli Pepper, the Australian, half Norwegian and part American Abyssinian cat, living in Tasmania! Nile Abyssinians (new window) in Sydney Australia. Mi Maggie. Great picture of your fine little boy - really does the colour of his ticked fur full credit. Yes, if taught from very young, cats can easily learn to walk on a leash. 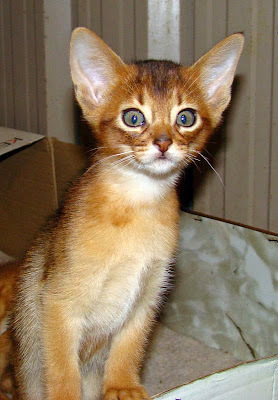 All Abyssinian breeders that I know of here in Denmark, require that potential buyers do not allow their cats to run loose. And, in my personal opinion, quite rightly so. Considering how curious and highly active Abys are, the leash is a good option for some exercise and adventure, albeit controlled. Still it's much better than being locked up indoor. Thanks, Mary!!! Those actually aren't all the countries on his pedigree, on the Norwegian side there's countries from all over Europe. Some cats don't enjoy being on a leash, especially the older ones. Cats who, like Chilli, have been exposed to leash walking from a young age to tend to handle it better. Chilli was 15 weeks old when we started training. Cars, snakes (you don't get snakes in England, do you?) and general cat haters are the reason that I keep Chilli indoors, as Chilli's breeder, George Kennedy would say "No cat has ever been run over inside!". He is so GORGEOUS, Maggie!! I love Abys and he is the nicest I've ever seen. He has quite a Pedigree, there! I think leash walking is a wonderful way to let them explore in a wild environment and it also is a great bonding experience. ~I hope to see more of Chilli on this site, maybe you could add a few more photos? Chilli is beautiful.That's a lovely photo of him. Interesting you live in Tasmania as I have lots of unknown relatives there.My gt gt grandad's brother was transported there in the 1850s at only 17 years old, for stealing bread and cheese.Being one of 15 children I think he must have been starving !He married twice and had 17 children himself. But back to cats, I've never liked to see cats on leashes but some do seem to accept and even enjoy it and it is a good way to give them a taste of outdoors. We are very lucky in England that we don't have the dangers some other countries have and most of us can give our cats their freedom. I love your photo of Chilli. He looks like a special boy. I also very much like the way that you have dealt with the difficult dilemma of giving a fine cat like Chilli a better life in a dangerous world by leash walking him. This must be one of the best solutions. I don't like the idea of permanent indoor cats as it is so unnatural it seems to me. The leash is a nice solution. Some people don't like to see cats in leashes but I can't see the objection. It is a practical and pragmatic solution.